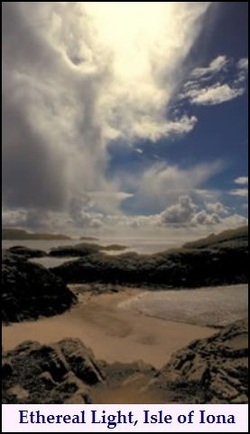 Hebrides means the Isles of the goddess Bride ... i.e., Sun Goddess BRIGID, aka BRIGHDE, BRIDE, BRIDEY, BRIGANTIA, BRITANNIA, who later became was incorporated into the Christian religion as the Christian Saint Bride. 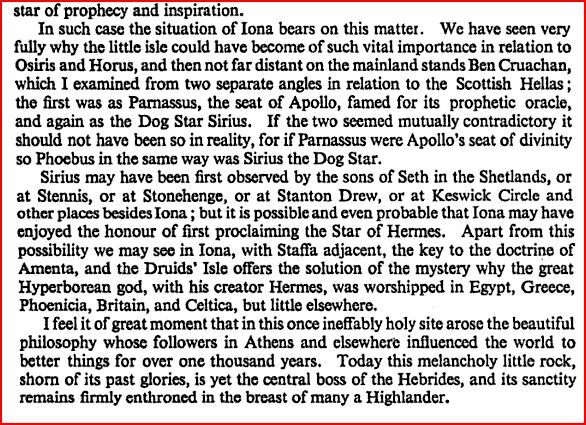 Iona is part of the Scottish Inner Hebrides - Isles of the goddess Bride. Tasked high and hard - but witness mine." In 807, the “Book of Kells” was also removed from Iona to Kells to save this luminous treasure of Celtic art from invading Vikings. Illuminated manuscripts from Iona’s scriptorium were thought to have supernatural properties. These Celtic designs were transferred to metal and stone. The Stone of Destiny was captured in 1296 by King Edward I (Long Shanks) and kept in England for 700 years. It was kept under the English throne through the coronation of Elizabeth II. It was only returned to Edinburgh in 1996 after an attempted theft. An influx of proto-Celtic, Bell Beaker people into Britain is now dated from 2900 - 1800/1700 BC. They brought beer, new beliefs about life and death, divination, farming techniques, and mortuary practices along with the art of metallurgy to the Neolithic culture. Groups assimilated in complicated patterns of movement that involved explorations, contact, settlement, diffusion and acculturation. This culture spread from Ireland to the Carpathian Basin and south along the Atlantic coast to Portugal, Spain, France, North Africa, Sicily, Italy, the Balkans, and Germany. These trade routes remained open. Their shamans were Druids, whose power came from contact with the spirit world. Iona hosted a Druidical college till the community was assimilated by Columba for his own community, but the Highlanders still recognize it as the Druid’s Isle. The Culdees wore a white dress, as did the Druids. They remained scholars and occupied places which had a Druidical reputation. They used the Asiatic cross, now called that of St. Andrew. Notably, in an Irish version of the gospel of St. Matthew, the phrase “there came wise men from the east” is rendered “the Druids came from the east.” They translated the Old Testament, Exodus vii. II, “magicians of Egypt,” as “Druids of Egypt," (Bonwick, Irish Druids and Old Irish Religions). The Druid "enlighteners" were fully aware of the 26,000-year cycle of Precession of the Equinoxes. They excelled in astronomy and astrology and ancient metrology. They knew the size and shape of the Earth. The seers were a hereditary caste of seers, philosophers, political advisors, priests, natural scientists, historians, doctors of medicine, judges, poets, royal advisors, astronomers, musicians, geometers, orators, navigators, and magicians. The Bards sang oracular songs. They preserved 'knowledge' or gnosis. The solar deity of Beltane was known as Bel, Beli, Belanus, celebrated with vast bonfires. Nicholas de Vere describes ancestral proto-Scythian Druids in The Dragon Cede (2010): "Witch" in Gaelic is "druidhe" -- drui -- or "druid." In practical terms a Scythian druid was an overlord. . .hence, a witch was a Dragon." So, the Druids were Scythian-Draconian overlords who came to proto-Scotland in ancient "Celtic" migrations. The Druids sang the nature of the king and formed all society in so doing. A Pendragon tradition says the Land and the King are one. The king derived his sovereignty, not from the sword, but from Mother Earth. We cannot own land. The land owns us. In original Scythian practice there were Three Kings: Priest King, Peace King, War King. And the Archdruids ruled over all as High Kings. The sword comes from the stone. Sovereignty comes from the Earth beneath our feet. That is the symbolism. Summarizing, de Vere continues, "Briefly, the Dragon lineage starts in the Caucasus with the Annunaki, descending through migrating proto-Scythians to the Sumerians while branching off also into the early Egyptians, Phoenicians and Mittani. A marriage bridge back to Scythia infused the Elvin line of “Tuatha de Danaan” and the Fir Bolg, which branched into the Arch-Druidic, Priest-Princely family to the Royal Picts of Scotland and the ring kings of the Horse Lords of Dal Riada, through the Elven dynasty of Pendragon and Avallon del Acqs, and down to a few pure bred families today." The myths of lost Atlantis are Egyptian. One of the oldest known example of archeoastronomy with stone circles (Nabta Playa, Nubian Desert) is in pre-sand Egypt, dated to the fifth Millennium BC. – 2000 years before Stonehenge. This temple of the stars demonstrates the sky ‘moves’ in a predictable long-term cycle. An alignment with Sirius in 6088 BC and other alignments dated to 6270 suggest an estimated date 1500 years earlier. The site was used as a necropolis in the Saharan wet period of pre-history, roughly 11,000 – 5,000 years ago when the playa bloomed. The area became arid 4,800 years ago when the monsoon returned to the equator. Egyptian culture moved to the Nile Valley. Egyptian beliefs were in Druid practice, but Egypt was originally a colony of Atlantis, the true source of the Druids. Although the Scythians of later ages were originally affiliated with the Megalithic Arya, some of their number became spiritually and morally corrupt. Today, a few mainstream historians and archeologists hesitatingly accept that Western "Celts" (sic) had settlements in the Middle and Far East. This is because these migrations were relatively late, historically speaking. They date from approximately 600 BC onward. The Hyksos/Atonists were originally Scythians from the West who migrated through Egypt. A Celtic cross places a circle around the arms of a Latin cross. 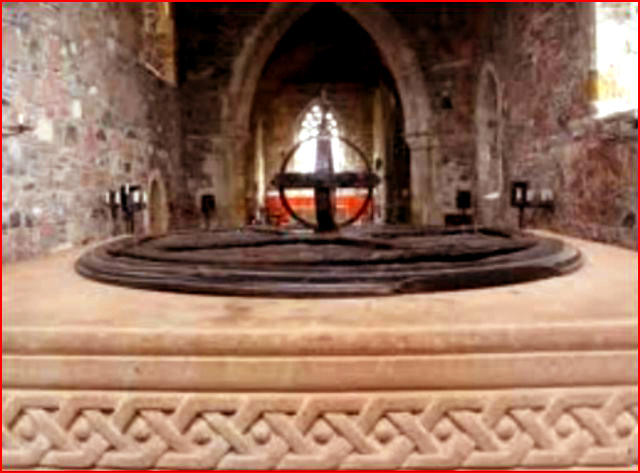 A cross within a circle or cross with multiple rays like spokes from a wheel is an emblem of the sun and is found on many stone carvings and objects prior to Christianity. The sun cross became the Celtic cross, uniting Christ with the luminous and cosmic power of the sun. Today, there are 60 to 70 remaining Irish High Crosses.The average height is over 10 feet. A few (Monasterboice) are as tall as 22 feet. Including all the British Isles, about 300 high cross monuments remain out of the several thousand. Many were destroyed during anti-Catholic periods. The large stone crosses developed from different influences, Egyptian and Armenian as well as Celtic. Biblical and local scenes were carved on the fairly soft (mostly sandstone) stone crosses. These crosses are generally found on or near monastic sites. Irish High crosses were used to mark boundaries, for gatherings and instruction, and for prayer. Some crosses request a prayer for the person who donated the cross. Originally, like illuminated manuscripts, the crosses were most likely brightly painted. SINNER AND SAINT; As Jeremy Irons prepares to play him in a movie, the violent story of Columba - and of how he journeyed from taking lives to saving souls. SINNER AND SAINT; As Jeremy Irons prepares to play him in a movie, the violent story of Columba - and of how he journeyed from taking lives to saving souls. EVEN as he ran, Columba knew he was too late. From the entrance to the abbey, he saw the glinting daggers plunge into the young prince's heart and throat. The boy died quickly, his blood seeping into the green pastures of Kells Abbey. Columba, the abbot who closed his eyes, knew this was only the beginning of a terrible war which would claim more than 3,000 souls. Of all the hundreds of saints that Ireland has produced, none can hold a match to Saint Columba for sheer drama. His epic story has entranced people ever since his first biography was etched with an inky feather back in the 7th century. By then his name was already legendary throughout the Christian world. He would go on to become the key saint of floods, poets, bookbinders and, most notably, of Scotland. By the 16th century, he was venerated by Lutheran, Anglican, Orthodox and Catholic churches alike.But though his name means 'dove of the Church', this gentle priest hid a dark past. And the decades he spent in Scotland creating a centre of worship and learning that lit a beacon to guide Europe through the Dark Ages were, in reality, a self-imposed atonement for the sins that saw him banished from Ireland. Now, more than 1,400 years later the story of Ireland's 'Royal Saint' is headed for the big screen with a movie called The End Time. Jeremy Irons has signed up to star as the magnetic Donegal missionary, with filming to begin in Ireland and Scotland next spring. The End Time will be directed by Bafta award-winning Norman Stone - who recently directed the biopic of Florence Nightingale. Certainly, in his early life Columba did not deserve one. Born on the grassy shores of Lough Gartan, Co. Donegal, Columba was a prince of the royal house of O'Neill. His father, Prince Felim, was a great-grandson of Niall of the Nine Hostages, the iconic 5th century High King of Ireland High King of Ireland (Irish: Ard Rí na hÉireann) refers to legendary, pagan kings of Tara. It also refers to later kings, who were, depending on the period, either the most powerful king of their day, or, in later times, exercised authority over most of Ireland. . The baby was named Crimthann but later changed his name to Colmcille and eventually Columba. His date of birth is stated as December 7, 521, 28 years after the death of St Patrick. Owing to the older man's efforts, Christianity had taken a firm root in Ireland and Irish monasteries were considered to be world leaders in faith. Young Columba was educated in the monastic school at Moville, on the shores of Strangford Lough in Co. Down, under the tutelage of St Finnian. He was described as a youth of 'tremendous energy and a vigorous personality', who showed great academic ability. After further training, he entered Clonard Abbey. Probably the finest Christian school in Ireland at this time, Clonard sprawled upon the banks of the River Boyne in Co. Meath and had as many as 3,000 students.
. Ordained in 540, he advanced to St Mobhi's monastery in Dublin's Glasnevin. Four years later, a bubonic plague ripped through Ireland, killing Mobhi. Columba left to travel the country building churches. His first monastery was built in an oak forest on the banks of the River Foyle on some land gifted to him by King Aed of Connaught. The settlement, upon which the Long Tower Church stands today, was later called Doire Colmcille, and is better known as Derry. He is also credited with founding monasteries at Kells, Durrow, Clonmore, Lambay Island, Swords, Moone, Drumcliffe and Glencolumbcille, close to his place of birth. Despite his obvious devotion to the Church, Columba's noble family still expected him to take up his rightful place in the royal lineage. The House of O'Neill invited him to stand as their candidate for the High Kingship of Ireland. He shocked them by declining, and his pagan cousin, Diarmuid Mac Cerbhaill, was nominated instead. A warrior, Diarmuid was enraged that he was his family's second choice after a lowly priest. Though he was duly elected High King of Ireland, he held a deep-seated bitterness for his Christian cousin. Columba's travels brought him to Dromin, Co. Louth, where his old mentor Finnian was now a bishop. While browsing through Finnian's library, Columba came upon a particularly rare book of Latin psalms written by St Martin of Tours Mar·tin of Tours , Saint a.d. 316?-397?. A room in a monastery set aside for the copying, writing, or illuminating of manuscripts and records. and created an exact replica. A furious Finnian demanded the book back, claiming it was property of the Church. Columba refused, reasoning that making copies of such work was vital to the spread of Christianity. Used in context of general equities. Involvement in a security, whether through a position, order, or inquiry. with his cousin. With cauldron-stirring druids whispering in his ear, in what is now regarded as the world's first dispute over copyright infringement, the monarch ruled 'To every cow her calf, therefore to every book its copy'.Columba had to hand it over. The decision ignited a bitter row amongst the O'Neills. The clan was split between the feuding cousins - and everyone was looking for an excuse to settle it by the sword This article is about the fantasy novel by Mercedes Lackey. For other uses, see By the Sword (disambiguation). By the Sword is the name of a 1991 fantasy novel by Mercedes Lackey. . In 561, during a hurling match at the annual Tailteann Games in Co. Meath, a row broke out on the pitch. Prince Cunan - son of King Aed of Connaught and another cousin of Columba's - dealt a deadly blow to the son of Diarmuid's royal steward. Realising what he had done, Cunan fled by horse to Columba's abbey in Kells. DIARMUID and his men tracked the fugitive prince down, stormed the abbey and executed him. Standing helplessly by as the daggers were driven into his young cousin's heart, Columba was incensed that they had breached the sanctity of the Church. With the boy's grieving father, King Aed, he made a pact to get rid of Diarmuid - and mobilised an army. To make a whirring sound. , another of the Twelve Apostles, interjected on his behalf and negotiated a compromise. Columba would go into exile in Scotland, where he vowed to spend the rest of his life gaining as many souls for Christ as had been slain in the battle of Cul Dreimhne. [Middle English currok, from Middle Irish curach; see coracle.] with 12 friends. 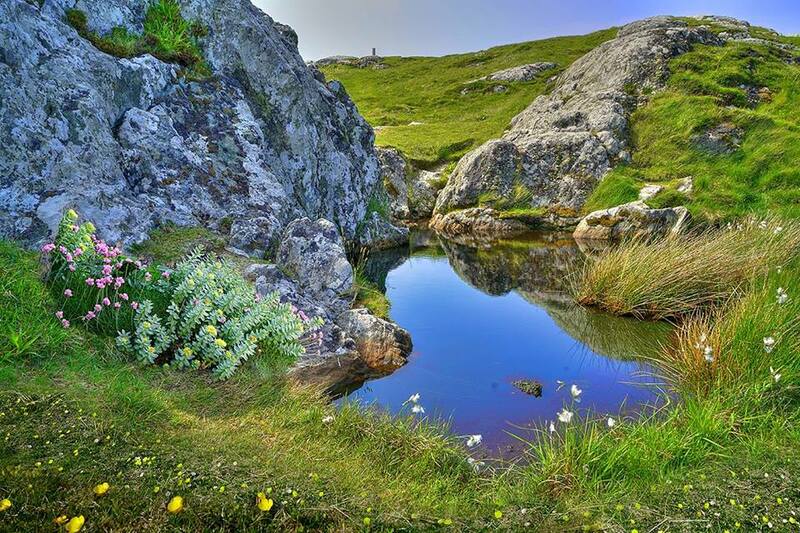 They landed on the island of Iona on the west coast of Scotland on the eve On the Eve (Накануне in Russian) is the third novel by famous Russian writer Ivan Turgenev, best known for his short stories and the novel Fathers and Sons. of Pentecost in the spring of 563. Thirteen years would pass before Columba returned to his native soil. Point on the surface of the Earth that is directly above the source (or focus) of an earthquake. There the effects of the earthquake usually are most severe. See also seismology. for an early Christian renaissance as its monks began to churn out books, art, music and, above all, eager young missionaries. From Iona, Columba ran an extraordinary network, dispatching monks to spread the word of the Church across Pictish Scotland.This evangelising came at a critical moment as Europe, still reeling from the collapse of the Roman Empire, was sinking into the Dark Ages. One who has the political power to influence the selection of a candidate for high public office. king . He also had a useful arsenal of miracles up his sleeve. For instance, when he arrived at the royal palace of Brude, one of the most powerful of the Pictish Kings, near Inverness, the gates were bolted against him. Columba made the sign of the cross and the bolts flew open. Brude was duly intimidated into throwing in his lot with the Christians. In 575, Columba returned to Ireland to attend the synod of Druim Ceat, near Derry, where he was welcomed with open arms by those who had cast him out over a decade before. He became a champion of Ireland's bards and poets, and his diplomatic skills were again called upon to settle disputes between feuding kingdoms. A renowned man of letters and hymn writer, he is credited with having transcribed over 300 books, including The Book Of Durrow The Book of Durrow (Dublin, Trinity College Library, MS A. 4. 5. (57)) is a 7th century illuminated manuscript in the Insular style made either at Durrow Abbey near Durrow in County Offaly Ireland, or in Northumbria in Northern England, with modern and traditional scholarship . In 592, as the Annals put it, Columba 'went to the angels from his body, after seven years and 70'. He died on Iona and was buried by his monks in the abbey he created. Two centuries later, after a series of devastating Viking raids, the monks of Iona fled. Many settled in Kells, the abbey Columba founded in Co. Meath, where they completed the Book of Kells Book of Kells: see Ceanannus Mór. 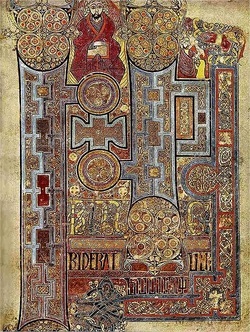 Book of Kells Illuminated manuscript version of the four Gospels, c. late 8th–early 9th century. , a masterpiece of Irish Celtic symbols, art and literature. Columba was disinterred and reputedly reburied in Downpatrick, Co. Down, along with St Patrick and St Brigid. No portion of this article can be reproduced without the express written permission from the copyright holder. Copyright 2010 Gale, Cengage Learning. All rights reserved. Would you believe these are you (Isaiah says; to the "isles afar off")? Are they descendents of the British Isles, Ireland, the countries of northwest Europe, the United States and even Japan? In an irony to Jewish history, could the tribe of Dan have gone to Greece and later to Rome? Could descendents of Dan have actually been involved with all the holocausts of Jewish history (Greek, Roman, Inquisition and Nazi Germany)? Was the royal bloodline planted in Ireland? Legend says Ireland was already populated by Hebrews before Jeremiah's arrival. Long prior to 700 B.C. another strong colony called "Tuatha de Danaan" (tribe of Dan) arrived in ships, drove out other tribes, and settled there. Later, in the days of David, a colony of the line of Zarah arrived in Ireland from the Near East. "Annals" of Irish History (Annals of Ulster, Annals of the Four Masters, etc.) are only reliably historical from 1,000 A.D. onwards. All material relating to time periods before the time of St. Patrick (430 A.D.) is legend. However, there is some truth contained in the "Annals" prior to 1,000 A.D. The "Annals" go back to about 444 A.D., but written copies date only from the 1400's. For instance in these Irish "Annals" there are 18 records of eclipses and comets which all agree exactly to the day and hour with the calculations of modern astronomers. The oldest piece of consecutive Irish preserved in Ireland is found in the "Book of Armaugh", written about the year 812. See possible historic lineage here. Conclusion. Take note that, Jeremiah's commission included "to build and to plant". Legend frequently is steeped in fact, no matter how confusing. The Lost tribes went somewhere...Perhaps Ireland and western Europe....or even southern Russia.